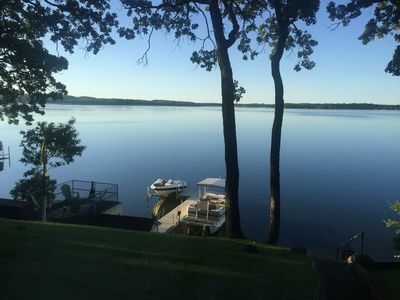 More Than Seven Memories On Lake Seven! Looking for a summer getaway? Lake Seven is a beautiful destination. 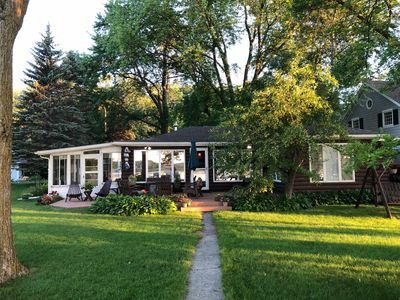 We're located about 6 miles from both Vergas and Frazee, MN, and about 10 miles from Detroit Lakes. 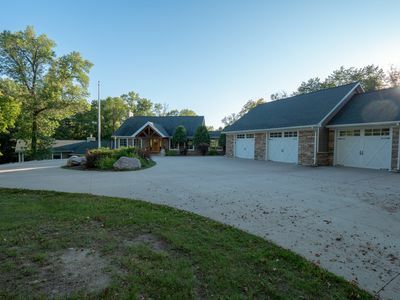 Our home is nestled in 1.4 acres of woods with 150' of lake shore on a quiet cul- de-sac, just off a dead end road. 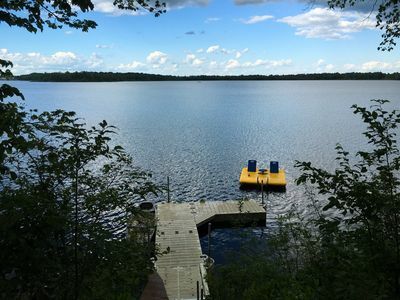 Lake Seven, also known as Scalp Lake, is one of the clearest and cleanest lakes in Minnesota, with a reputation for good walleye fishing. It's also locally popular with scuba divers. 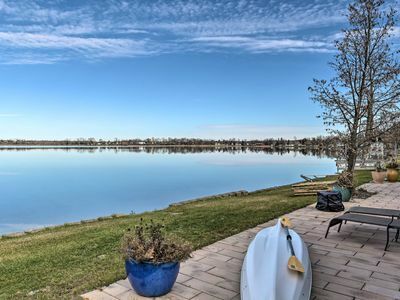 The lake covers about 250 acres, with a maximum depth of 90'. Enjoy the kayaks, paddle boat & paddle boards, all included with your stay. 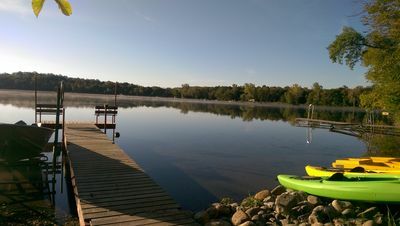 Go fishing, swim, water ski or do a little floating ( we have several). 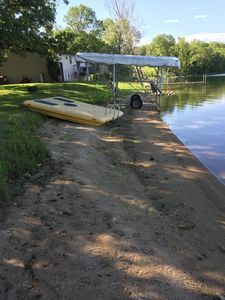 Boat/pontoon rental is available through a local vendor. We will provide their contact info if you're interested. We have a 32 ft. dock with attached benches to relax and enjoy your morning coffee or to watch the sunset with a glass of wine. You’re welcome to bring your own boat. There’s plenty of room to tie up. If you bring your trail bikes, you can enjoy miles of winding country roads and trails. Enjoy the wildlife - eagles, owls, swans and many other birds. Every year Lake Seven is home for at least one nesting pair of loons, and you will likely see deer, wild turkeys, and maybe a fox. There are several golf courses nearby. 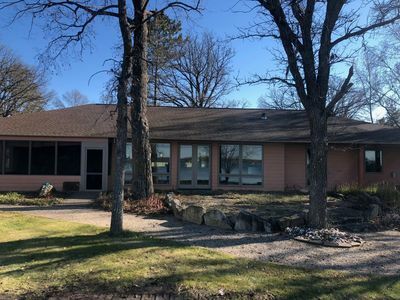 The famous Detroit Lakes Country Club, host of the annual Pine to Palm Tournament in August, and the premier Wildflower golf course, along with others near by. There’s lots of shopping, dining and other activities less than twenty minutes away. 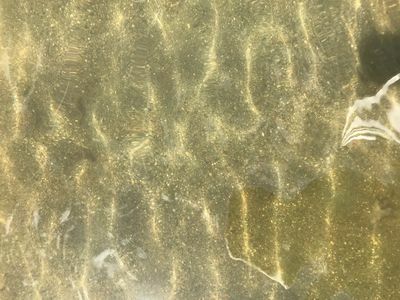 Detroit Lakes hosts the Northwest Water Carnival and WeFest country music festival. Restaurants include Zorbaz on the Lake and the newest hot spots in town, Hub 41 and Spitfire Grill. Don't miss the popular flea market every weekend. Vergas has several fun shops and restaurants, including Spanky's Stone Hearth, and Billy's Corner Bar. If you find yourself missing city life (not likely! ), Fargo-Moorhead is about an hour away. Inside, you'll find a year around home decorated with style. 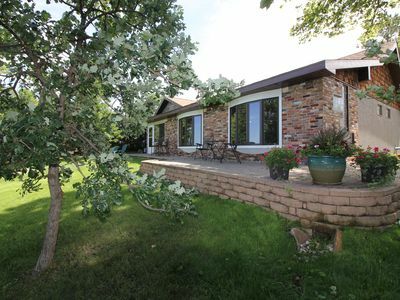 We offer three bedrooms, (one up, two down), 2 1/2 baths, and laundry room. The master on the main floor has a queen bed, and one bedroom downstairs has one twin and a full bed, and the other room has a queen bed. There is a pull out sofa in the family room. 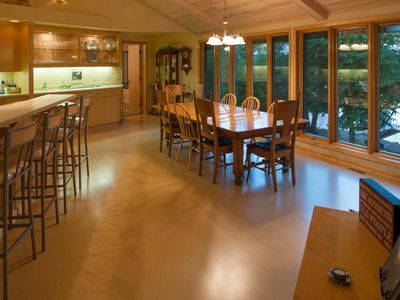 In the lower level you’ll find the family room with flat screen, and a cast iron gas stove. It's a nice place to gather if the evening is chilly. 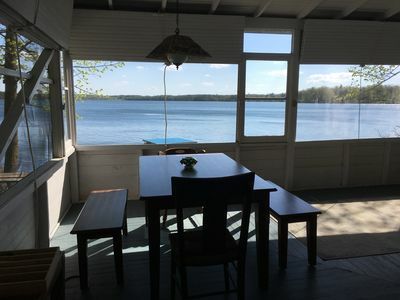 Walk out into the screened in porch that overlooks the woods and lake. Sit for a while and listen to the birds and rustling leaves. Bring a book, because you’ll want to linger a while. The kitchen is large and is well equipped. The view from the adjacent dining area is just as good as from the upper deck, which is where you will find the grill and outdoor eating space. 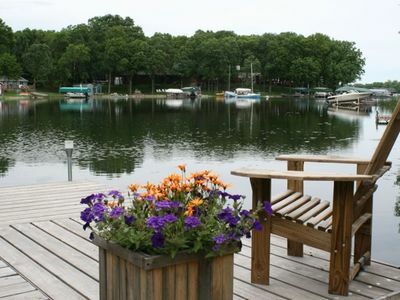 It overlooks the natural forest and the boardwalk leading to the lake. When you're relaxing on the upper deck you're surrounded by trees, and it feels like you’re in a tree house. We know you'll love it as much as we do! 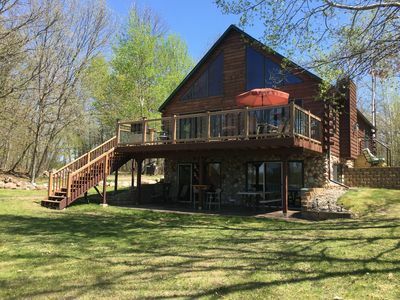 190ft of Private Shoreline - Relaxation, Fishing, & Fun On 2 Acres! 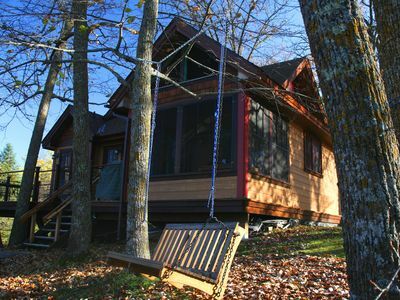 A lake to yourself with a newly remodeled cabin interior! 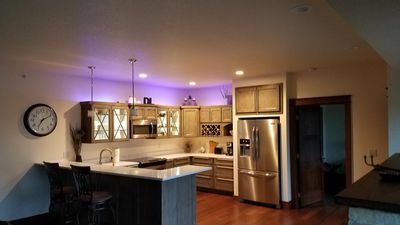 DETROIT LAKE HOME WITH BEAUTIFUL SUNSET VIEWS! 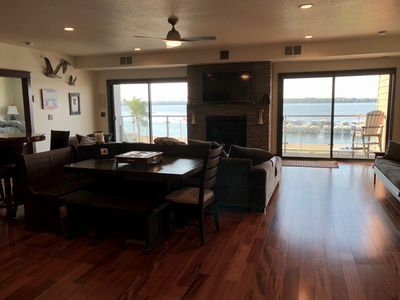 Beautiful Sunsets In Luxurious Condo Located At The Heart Of Detroit Lakes. 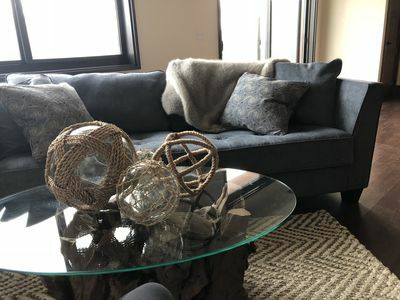 Stunning Luxury Condo in the heart of Detroit Lakes! 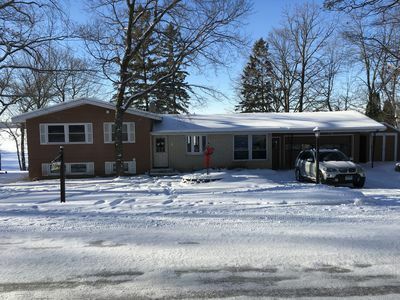 Spacious 3 bed, Two bath Lake home, Located on the strip in Detroit Lakes! NEW! 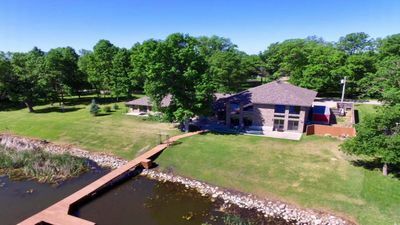 Lakefront Home 10 Min from Detroit Mountain!